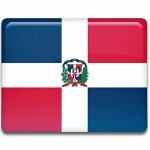 Our Lady of Altagracia Day (Día de la Altagracia) is one of the public holidays in the Dominican Republic. It is celebrated on January 21 each year. Our Lady of Altagracia, also known as Our Lady of Grace or Our Lady of High Grace, is the patron saint and protector of the Dominican Republic. Our Lady of Altagracia is a portrait of the Virgin Mary in a Nativity scene painted circa 1500. The portrait was brought to the island of Hispanola by Antonio and Alfonso Trejo, two Spanish brothers who were the first Europeans to settle in Santo Domingo. Eventually they donated it to the church in the city of Higüey. The first shrine dedicated to the portrait of Our Lady of Grace was completed in 1572. Almost four hundred years later, in 1971, the image was moved to the present Basílica Catedral Nuestra Señora de la Altagracia in Salvaleón de Higüey. The image of Our Lady of Altagracia was crowned by Pope twice, in 1922 by Pius XI and in 1979 by John Paul II. The feast of Our Lady of Altagracia was originally celebrated on August 15. However, it was moved to January 21 in order to celebrate the victory over French invaders in 1690. The holiday is marked by all-night vigils, special services, festivals, dancing, and singing.